A-Lert is geared to handle the most challenging vessel fabrication requirements. Our well-equipped tank fabrication facilities have the necessary material forming equipment to fabricate vessels, pressure vessels and tanks of various shapes and sizes. ASME pressure vessel fabrication is one of our specialties. Since 1987, A-Lert has been certified to use the American Society of Mechanical Engineers (ASME) “U” and “S” code welding stamps, as well as the “R” stamp from the National Board of Boiler and Pressure Vessel Inspectors. 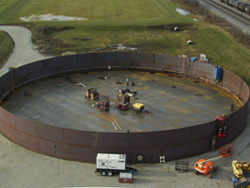 For all your new tank or vessel construction requirements, A-Lert has the competent, experienced staff and modern resources you need to provide a quality product at a competitive price.